The Arouquesa, a triple-purpose breed, supposedly gets its name from the municipality of Arouca (Terras de Arouca) in northern Portugal. The Arouquesa is thought to have evolved from a mixture of Barrosa, Mirandesa and Minhota. 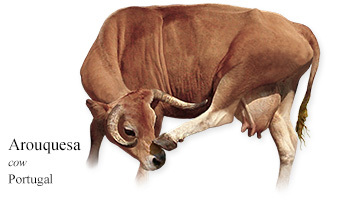 Although they resemble the Mirandesa, they have longer horns (probably thanks to the Barrosa). My Daily Cow® Portugal and read about other Portuguese cattle breeds.